The bi-annual Decatur Community Leaders breakfast is Thursday, May 10th, 2018 at the Decatur Conference Center and Hotel. Key Note Speaker is Lieutenant Colonel Robert J. Darling. In October 2007, Lieutenant Colonel Darling retired from the United Sates Marine Corps with just over twenty years of active duty service. Lt. Col. Darling supported the President, Vice President and National Security Advisor in the President’s Emergency Operations Center (PEOC) on September 11, 2001. 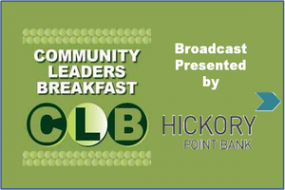 Breakfast will be served at 7:00 a.m. and the program will begin promptly at 7:30 a.m.
Broadcast of the Community Leaders Breakfast is presented commercial free thanks to Hickory Point Bank.